This entry was posted on March 27, 2017 by Rachel. Even with a normal use of your iPhone, the battery is quickly empty and for no obvious reason. 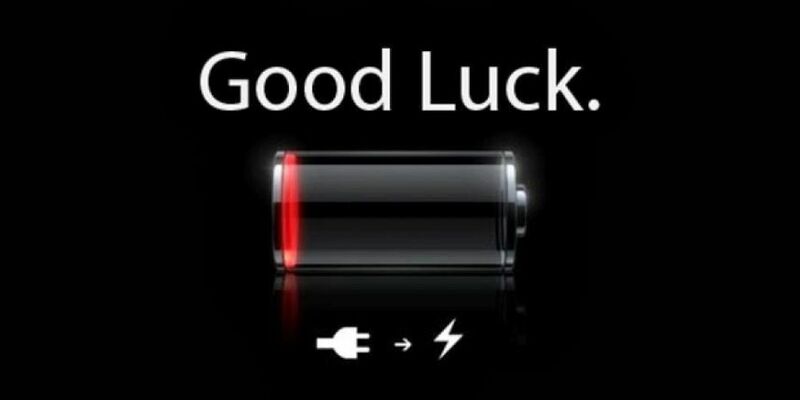 Of course, it always happens at the worst time, when you really need your phone. For example, if you are in a new city and before you have had time to look where to go, no battery... Good luck to find your way without a phone! This problem is well known with iPhones and other smartphones. But why then? And how can it be solved? What is wrong with the battery of our phones? The battery of our phone can sometimes be so important. With iPhones and many other smartphones, the battery is not big enough to stay all day without charging. Also, the battery is fragile and can be degraded after a lot of use, especially if you charge without waiting for the battery to be completely empty. We have heard also that the notifications coming all day long would use too much battery. But other theories say that the connection 4G high speed would use your battery especially when the network coverage is low. Another point is that when it is too cold or too hot, the battery also has trouble managing the temperature differences. What to do to save your battery? Already, you can activate the "energy saving" mode everytime you don't need the full use of all functionalities of your phone. This last feature on the iPhone is probably the most effective remedy for our problem. It allows the battery to last longer because when activated, the iPhone will automatically reduce the screen brightness and optimise all the performance of the device. With this mode, you can still use your phone almost as usual. The brightness will be lower but in addition, it's better for your eyes! In addition, 4G connection and applications such as Facebook, Instagram or Snapchat use a lot of battery as they checking for notifications all the time. You can also consult the battery usage of each application from your phone (Settings> General> Use> Battery usage) and decide which unnecessary applications to close to save your battery. Finally, avoid exposing your phone to extremely hot or cold environments. Extreme temperatures can be fatal for the battery. It is important to never let the phone under the sun and avoid using it outside in a case of severe cold. There is also another option: the power bank. This little thing can save you in difficult times! GoCustomized's power bank lets you extend the use of your phone everywhere. You are free to go everywhere and not be always looking for a plug in the whole. In addition, with GoCustomized, you can personalise it so it suits you and nobody will mistake it for theirs! Buy your customised external battery now! Don't forget about the low battery setting! This entry was posted in iPhone, Accessories, Smartphones and tagged battery, accessories, iPhone on March 27, 2017 by Rachel.